I'm a pensive fanboy for style combinations. At times the blending of brewing techniques can yield new flavours. Or it can go wrong and raise the question, "How do I spit out this mouthful of beer in a crowded bar?" Luckily this bottle by Phillips hits the former category. This tees up a stronger dark malt base (dunkel?) and allows a saison yeast to dive in an do its thing. Will spicy phenolics mesh with a rich, dark fruity malt canvas? I'm sure others will disagree with my thoughts. From the start, the spicy phenolics dominate the nose. There might be a little dark bread if you dip your nose into the foam. Each chewy mouthful supplies something new. 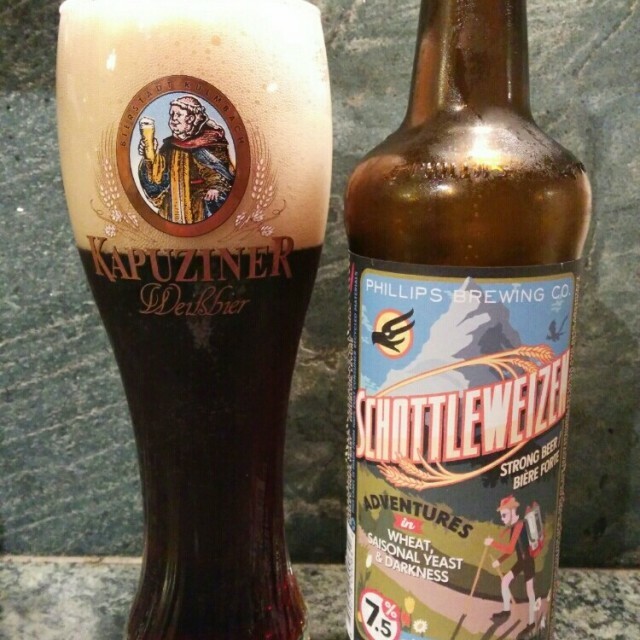 The Schottleweizen is all over the map with flavours of dark breads, chocolate, prunes, bananas esters intertwined with a spicy saison yeast. It fades just as it starts. Perhaps a little unfocused but still very tasty. Glassware: Definitely need a weisse glass to accommodate the massive head on this beer. Food Pairings:Something dark and spicy will work well here. Chicken mole or Jamaican jerk might be in order. What cheese, what cheese? Let's be bold and pair this with a roquefort. If you like desert, try this with flamed bananas with a cinnamon rum glaze. Cellar: Nope. Most of the flavours are yeast dependent and should fade quickly. Some days you just want to be alone. The desire to unplug from the metrics of the daily grind can, at times, seem hopeless. How many IBU's is this IPA? How is your hockey pool doing? How full is your PVR? Numbers, metrics, grades.. Sometimes all one desires is a simple, uncomplicated experience. 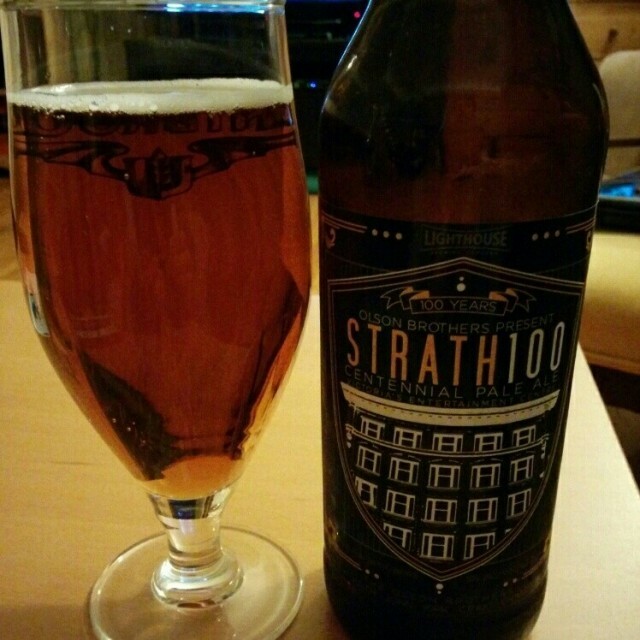 This is why I picked up the Strath 100 from Lighthouse. I hoped for a simple beer. After all, it was intended for the masses of 20-somethings that consume volumes of whatever is on special. Certainly this would be a linear beer that I could review and ignore. DAMMIT. This is a tasty beer of furtive duality. At first sip, or gulp, it seems like any other 5% pale ale. Slightly citrus and floral with a calm bready/sweet malt backbone. For most people, this is where the story ends. However, it is easy to overlook a first for Victorian and possibly North American beer drinkers. This beer uses a new breed of hop called Vic Secret. Think of this hop as a toned down Galaxy. The citrus flavours are not the ones we are used to tasting. Sensations of pineapple and tropical fruit can be noted. A stealthy infiltration of unusual hop flavours into the Victoria collective palate. One might think of this a covert, Australian plot to get Victorian beer drinkers hooked on southern tier hop flavours. I'm OK with that. I kinda gave away the flavours in the preamble. 100's nose is calmly fruity of all things tropical (pineapple, mango). The unassuming medium to full mouthfeel can easily be overlooked. Yes, this beer contains the required citrus and bready flavours of a PNW pale ale. Tropical are the citrus in question. Hops dominate with pineapple, tropical fruit salad and earthy resins. A great mix for the ashy and bready malts. It all fades clean away. Well done. Food Pairings: Anything will work with this beer. I'm thinking BBQ (veggie) burger action on the patio. Might even work with a quality grilled cheddar cheese sandwich. Can there be trends in beer? There most certainly are. Brewers can use the hippest new hops (Citra, Amarillo, southern hemisphere), brewpubs can host tap takeovers or they can brew an India session ale. Other trendy things to do include putting your beers in tall boy cans or brewing a black anything (black IPA, black saison, black lager). Regardless, I digress. Even though I forgot to mention the act of filling multiple sizes of growlers. Back to the India session ale. Certainly this beer style was born from the desire to have a hoppy beer but still be able to function and operate heavy machinery. A session ale does not have a defined ABV strength or even a style. Let's call it the opposite of imperial. So a session IPA will be the flip side mirror image of an imperial IPA. My definition of a session beer has an ABV that hovers near the 4% mark. My hero Stephen Beaumont has similar views. This means Spinnakers Swiftsure almost qualifies (4.5%), Phillips Bottle Rocket ISA certainly does not (5%), but the Central City ISA certain does (4% ABV). The Sabotage does not come close at 4.8% ABV. Another complaint of people who drink ISA is that they taste weak or thin. This -made up- style of beer has a low ABV and an attenuated malt profile. Perhaps this weakness perception is due to preconceived thoughts of all beers that contain the word "India". We see the word India, then smell the big hop nose and expect a malt and alcohol slap to the forehead. Our expectations are unfulfilled and we blog that this beer tastes weak. Well too bad. Some of us want to drink a few hoppy pints and still be able to operate heavy machinery. DISCLAIMER, the only heavy machine I operate after a few pints is my PC. Sometimes that is not such a good idea. Ok, so what does this beer prick think about the Sabotage ISA? The nose contains that composite of PNW C hops that we have been conditioned to seek out. There is a slight grassiness as the beer warms up; Kendrew is this beer dry hopped? There are equal parts sweet pine, vague citrus and slight floral spiciness. A meager graham cracker graininess is also present in the aroma. Mouthfeel for a session ale is often disappointing, but this is not a session ale so the mouthfeel is pleasantly thin to full. Each sip is fairly linear and parallels the nose. Some have mentioned a slight sulfur aroma, but it's not an issue. The linger is slightly slick but carries the citrus hop bite nicely. Nicely done, even thought it is not really a session ale. Appearance +1 nice label art and reasonable description of flavour. Yes, I know it is a growler, but I stared at the art while it was being filled. 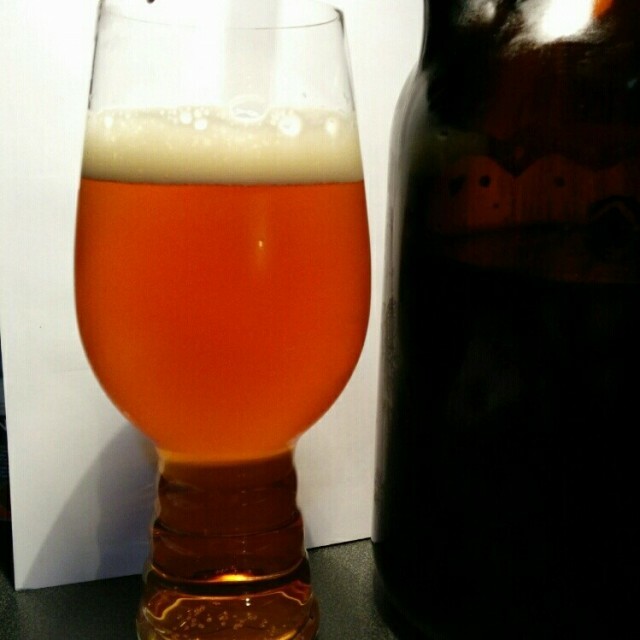 Glassware: You can be a DB like me and buy a IPA specific glass (in photo). This is not necessary, grab a tulip or flared pokal. Nevermind the knowledge of what a flared pokal indicates DB tendencies. Food Pairings: This would pair with almost anything. It would go well with spicy Szechuan, the hops would make the spiciness even hotter. Remember there is little malt backbone to calm the spices. Maybe an aged cheddar and pasta would be nice. How about a cedar planed salmon with calamansi reduction glaze? This author discloses that he received a complimentary growler fill. Thanks Kendrew and Rob. If this beer was not up to standards I would still report as such. But it is dang tasty, even though it is not sessional. VOTE WEST COAST COMMON. I have been a little lazy with beer reviews. Luckily there have not been too many. Other good beers this week include the Lighthouse Strath 100 and Phillips Barrel Aged Rauch. 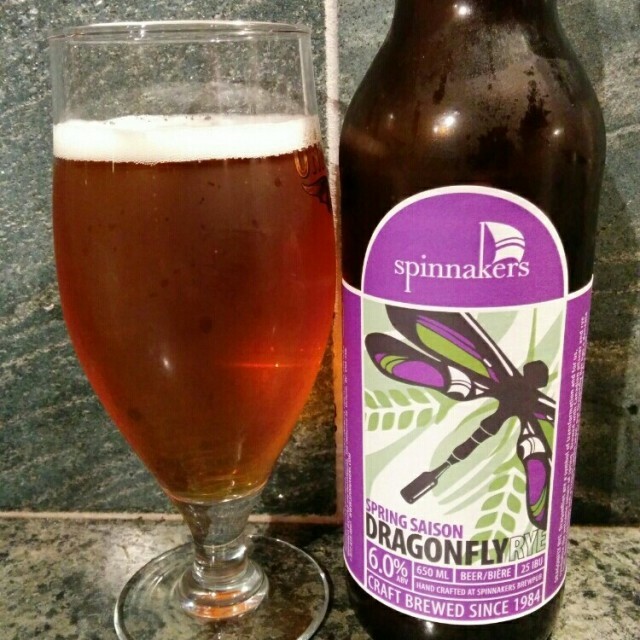 This is the latest beer release by Spinnakers. Did have one little peeve with my experience at Spinnakers. I brought my growler in for a fill of the Irish Stout. It was on the draft list, but not on the growler fill list so the nice lady behind the counter said I couldn't get any. If only she mentioned that I had to walk upstairs to get my fill of Irish Stout, I would have been a happy blogger. This was partially my fault, because it is mentioned in the email newsletter Spinnakers sends out. I always forget to read the fine print. Anyways back to the beer. We need more rye in beer. It adds a great dry, grainy and spicy character. This ingredient is also helpful in head formation. Rye is unfairly considered an adjunct in brewing, just like corn, sugar, caramel, potatoes and spices. Basically if it is not malted barley, it is considered an adjunct. Which I think is unfair. Imagine lumping rye and oats together with corn syrup? Let's instead call it a superawesome unappreciated brewing grain, or SUBG for brevity. Enough ranting, how was the beer? The initial aroma announces rye with its characteristic grainy and spicy scent. This blended nicely with the spices from the saison yeast. Each sip is creamy with that rye spice, slightly juicy with minor earthy hops. The rye does dominate the flavour but doesn't overpower. It brings out the flight fruitiness and lingers just longer enough. Very nice. Food Pairings: This would be nice with Thai food. The spicy characters would blend nicely. A nice Welsh rarebit with rye bread and sharp cheddar would resonate with saison's flavours.